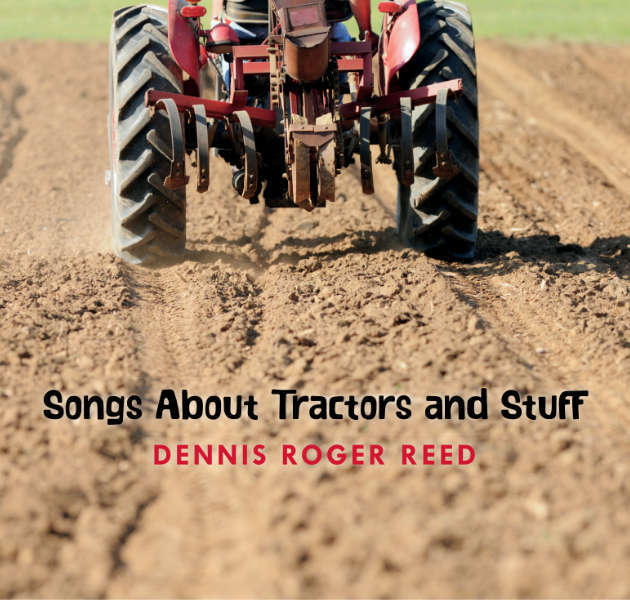 Dennis Roger Reed's "Songs About Tractors and Stuff" continues Reed's blending of a variety of roots music including but not limited to folk, blues, swing, and bluegrass, once again blending originals and new arrangements of some well-known songs, and some rarely discovered gems. And a great intermission song by Tim Horrigan. Reed features two separate bands, once again including bottleneck and swing guitarist extraordinaire Mike Dowling. As always, it's a family affair with brother Don Reed holding down the core of the And Stuff Band on the second part of the recording. Dennis' wife Waverly Boling Reed returns as Art Director. The great cover is her work, and special mention must be made of the tractor wheel and tire CD and the tread tracks on the base of the digi-pack being particularly striking. Songs About Tractors and Stuff completes the trilogy that began with Little King of Dreams and continued with Cowboy Blues. All three projects harken both to different times while not ignoring the present. All feature original songs, some of which seemingly defy era. Songs About Tractors and Stuff takes a look at obvious influences (the Byrds, the Flying Burrito Brothers, Johnny Cash) but also pulls songs from possibly less likely sources (the Bee Gees, Rod Stewart and Ronnie Wood.) The theme of returning home and revisiting the past remains as well. Songs About Tractors and Stuff is two projects glued together by Tim Horrigan's delightful Intermission. The first half, Songs About Tractors, is the more acoustic of the two. It features Mike Dowling as the core of the band, with Dan Fuller on snare and hi hat and Jamey Holbrook on bass for most of the cuts. DRR adds guitars and mandolin. The And Stuff Band has Don Reed at the core and Phil Hawkins on drums, with DRR on guitars and bass. This second part is a bit more country in taste, with electric guitars and full kit drums. From the very first blue notes of Dennis Roger Reed's guitar, I knew I was hooked. And the vocals that followed did not disappoint. Reed has "that sound" – so casual, so fluid, so rhythmically right-on-the-money – that makes his blues-infused Country/Americana, rootsy, rock-a-billy and other "stuff" groove so immediately appealing. It's a sound that conjures up fantasies of old-time honkytonks and gritty biker bars; yet at the same time, it's the timeless sound of polished talent. But before I go further, let me make one thing clear: This CD is NOT about tractors. Mr. Reed has a sense of humor – as evident in some of his upbeat original songs as well as the liner notes, in which he explains that the album's title was inspired by the words of a "fan review" which read: "There was a group of geezers playing songs about tractors and stuff to an apparently appreciative audience of slack-jawed locals..."
Well, I wasn't there. But you can definitely count me in on the "appreciative" side. And for all the tongue-in-cheek attitude, the title does, in fact, do a good job of conveying the down-to-earth, country feeling of this album – as well as its eclectic predisposition (the "stuff" part). Songs About Tractors and Stuff is Reed's third album, produced after a ten-year hiatus, and offers up a generous 17 tracks. That's a lot of songs. But with the average song little more than 2 ½ minutes long, the album goes by very fast (just over 45 minutes) – as fast as the train on the opening track, Folsom Prison Blues by Johnny Cash. Eight of these songs are Reed originals, and nine of them are covers of country classics, ballads, folk-rock, traditional folk...even one piece of popular old-timey theatre or circus music, Intermission by Tim Horrigan. But "covers," when it comes to D.R. Reed, is an inadequate term; "innovative arrangements" would be better; and in many cases, "reinterpretations" would be better still. This man knows how to put his own stamp on a song and take it to another level. To put it another way: Reed's originals sound like old Country classics. And his classic covers sound original. My favorites among Reed's originals are three Country love songs – Crazy Old Arms of Mine, I Remembered That I'm Lonesome, and After All This Time. Like all great songs, they have an authenticity that makes you feel like they have always existed, without ever sounding trite. Then there are some rollicking, fun songs like Take a Whuff and Mr. Lucky; and a very interesting Celtic-sounding instrumental, Quaich. His covers need no introduction. In addition to Folsom Prison Blues, you'll find a potpourri of popular songs, including Words by Barry, Maurice & Robin Gibb; Sin City by Gram Parsons & Chris Hillman; Gasoline Alley by Rod Stewart and Ronnie Wood; and Mr. Spaceman by Roger McGuinn; as well as traditionals like Corrina Corrina, and Spacey Grove (a brilliant electronic instrumental takeoff of the English folk ballad, Matty Groves, capturing all the dark tension of the ancient narrative of adultery and murder). In every case, the songs retain their original "essence" within a completely fresh format. To this end, Dennis Roger Reed draws on his own multi-instrumental talents, as well as those of some first-rate players. In addition to acoustic and electric guitars, he plays mandolin, bass, and Porch Board (an amplified low-end rhythm instrument that you play by tapping your foot). His 7 string guitar arrangement in Corrina Corrina is nothing short of addictive! He also does many of his own harmony vocals – and the album is laced with great tight harmonies! Some of the other outstanding artists who season this musical gumbo are Mike Dowling on all manner of guitars, including bottleneck...Dan Fuller or Phil Hawkins on drums.... Marty McPhee on harmonica (so wonderfully melancholy in Folsom Prison Blues! )...Ellis Schwied on fiddle...Tim Horrigan on piano and accordion...and Dennis' multi-instrumental brother, Don Reed, on acoustic 7-string guitar, mandolin, and electric guitar. Used intermittently, these players add a rich and varied texture to the album...and that texture extends to Reed's vocals, as well. From his stylized country affect in Folsom Prison Blues, using a deep, gravelly voice, to his "straight-from-the-heart" delivery in After All This Time, Dennis Roger Reed is a pleasure to listen to...the real deal. And at the end of the album, I can bestow my highest compliment: Songs about Tractors and Stuff always leaves me wanting to hear it again. You might like if you enjoy: Gram Parsons, the Byrds "Sweetheart of the Rodeo"
Tell me more: From the opening strains of his cover of the Johnny Cash classic "Folsom Prison Blues," it's clear Dennis Roger Reed is on a mission. "Song About Tractors and Stuff" features plenty of original Reed songs (including the melodic "Crazy Old Arms of Mine"), but also features a number of artful remakes that celebrate authentic stylings that recall country music's rich past. Among the standouts is a cover of the Gram Parsons/Chris Hillman song "Sin City," a shimmering bluegrass-meets-country rock take on the instrumental "Spacey Grove" and an Americana-brushed touch to the Bees Gees gem "Words." Dennis Roger Reed… the name will mean something to people who have the habit of reading liner notes on CDs. Reed was a member of the Andy Rau Band and Blue Mama, has played for three decades in a mostly acoustic manner and he moves generally in niches such as bluegrass, acoustic folk music or blues and country music. On this new CD he ventures, with the aid of friends such as widely-acclaimed as Mike Dowling, and Dan Fuller and Jamie Holbrook, to a number of covers, which he completes with own numbers that fit in well. The CD is in fact in two pieces: the songs concerning motor tractors (1 up to 10) and that concerning stuff (11 up to 17). In the motor tractor department you find versions of Folsom Prison Blues from Johnny Cash, Words by the Bee Gees, the traditional Corrina Corrina, Jimmie Davis' Shackles and Chains and Rod Stewart's Gasoline Alley. The second part of (or the Stuff part) include Mr. Spaceman from the Byrds, Gram Parsons' Sin City and the traditional Spacey Grove. One half of the songs has been therefore carefully selected covers and other half good originals, where Reed lets the instrumental capacities of the band and guest bandsmen shine. A very elegant CD, made for people who are not in rush and enjoy music that isn't stressful and harkens back to the roots - music, however, you can appreciate: mostly quiet songs, played by people with knowledge of their instruments to this junction of folk music, blues and country music. This excellent CD has strong originals that stand up well against the covers. The audience is possibly fifty years old or beyond, but I can quietly claim that young people can also take advantage of this type of music: you learn more history and your ear begins to distinguish and recognize good music. I don't need more than that for me and I would be very glad if all CD's music had this level of quality. As a member of several bands and a solo performer, Orange County's Dennis Roger Reed has played blues, folk, bluegrass, and country-rock music. He writes songs, sings, plays guitars, mandolin, and bass and is a regular at folk and bluegrass festivals up and down the left coast. His new album is Songs About Tractors and Stuff, a generous, 17-track mix of vocals and instrumentals, covers and originals; the first nine tracks and the last seven recorded with different backing bands. All of it is produced by Reed and sounds consistent: mostly acoustic tunes sung in his strong tenor voice with a loose, almost jam vibe. And the music isn't really about tractors at all. The first of nine covers is "Folsom Prison Blues," the treasured country relic, and Reed isn't trying to mimic Johnny Cash: it has finger-picked guitar overlaid with both dobro and slide guitar licks, harp, and a brooding minor chord feel. It gets points for an inventive approach to the song everyone knows by heart, though Reed hams up the vocal a bit too much. "Crazy Old Arms" is a catchy original that works because it plays to Reed's and the band's strengths – harmonies on the choruses, lovely fiddle playing, and a distinct hook making this country ballad score. The level isn't sustained, however, as "Words" follows, a puzzling cover choice. This '60s Bee Gees song is given a bluegrass treatment similar to "Folsom," but the poppy, sing-song style of the tune is a poor match to the rootsy mandolin/acoustic guitar arrangement. Reed is on firmer ground with his originals, like "Take a Whuff" and "Stone in My Shoe," both of which are short, pleasant, and quirky folk/pop pieces, especially the latter, which has a clever hook and lyrics about how his relationship with a unpleasant lover, which "is like walking with a stone in my shoe." The best cover is "Gasoline Alley," a great song that is hard to go wrong with, and Reed nails it with a rollicking version that includes layers of acoustic axes, mandolins, slide, and fiddle – while retaining enough of Rod Stewart/Ron Wood original's bones that it is a highlight. "I was almost happy just the other night," Reed sings in "I Remembered That I'm Lonesome," as he spots a parted lover while out to party; his alt-country relationship song probably more memorable for its lyrics than a drop-dead hook. With "Mr Spaceman" he scores with another cover, this time Roger McGuinn's funny Byrds single – somehow fitting perfectly with the other material here; it is two minutes long (the 17 tracks clock in at 44 minutes); has clever, quirky lyrics; and is played expertly. One of Reed's best contributions is "After All This Time," a mid-tempo tune with accordion fills, and harmonica that give it a zydeco flavor, to wrap the disc. Dennis Roger Reed's Songs About Tractors and Stuff offers acoustic music fans a wide variety of ear-catching arrangements of both originals and covers.